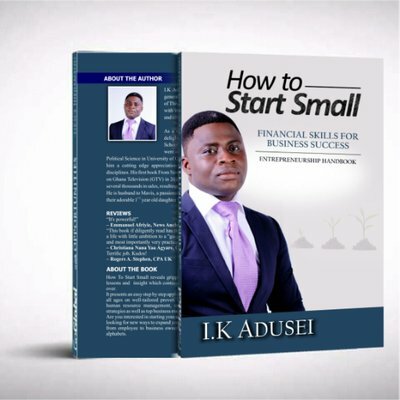 In his latest book now available worldwide on Amazon titled, How To Start Small: Financial Skills For Business Success, I.K Adusei has this to share. "In the many events, training programs, conferences and workshops hosted by my non–profit venture, Africa Business Network (ABN), I have had the rare privilege of being confronted by participants with mixed questions on starting and running a business. Here are a cross section of those questions, some of which may be of use to you. 1. Q: I want to setup a team for my business. What are the basic things you would look out for when hiring your staff? IK:It is good to hire people who demonstrate commitment and dedication to work. But over the years I have come to learn that, to hire a committed and devoted person who is not trustworthy is a launch pad for failure in business. Trustworthiness stands out among all the basic things to look out for when hiring. Unfortunately, no one comes to a job interview with trustworthiness boldly inscribed on their foreheads. So you have to hire the most disciplined people and monitor them closely to identify the traits of commitment, dedication and above all trustworthiness. Keep those who have the latter. As an employer, the buck stops with you. You remain fully responsible for the team you choose to work with. So you need to put in place a robust system to check the conducts of your employees – even those you deem trustworthy. 2. Q: Why do you think it is important to think big? IK: It doesn't cost a pesewa to think big. It is absolutely free. It takes the same energy to think big as to think small. True success always has a small beginning. To ever succeed you need to think big. It cost USD $ 0.00 to think like a billionaire. This is why it is important to think big! After all, if you succeed you win; if you don’t, you lose nothing. 3. Q: I have about USD $ 10,000 to invest in a business. Which business do you think will give me a good return on my investment? IK: Like real estate, location is key to business success. While a business will do well in a certain location, it will perform poorly in another. Carefully study the needs of your immediate community. Find a need that is related to your passion or interest and make sure people will be ready to pay for your product or service. Such a business should be scalable for you to achieve maximum financial rewards. Design a creative way to make money delivering the product or service. With the best business practices and principles – most of which are encased in this book, you will guarantee yourself a good return on your USD $ 10,000 investment. 4. Q: What keeps you going when the going gets tough? This keeps me going no matter what. 5. Q: I believe in financial literacy. Do you think financial literacy should be made a core subject in our schools? IK: This is a very good question. My answer is an absolute yes! Financial literacy should be thought in schools from first grade to the tertiary level. This is the only way we can create the enabling environment for private sector growth in our economy. When people are financially literate, they can create surpluses (savings and investments) which the banks can use to support their liquidity situation. They can give out more loans to support businesses. More financial surplus means more seed capital available for the creation of more businesses. ABN through its flagship program Commence is working hard to make this possible. Check our website now www.abnonline.org and search for ABN Unite for more updates! 6. Q: I have a small business. I always find out that my workers steal from me. What can I do now since I do not have money to invest in high tech security systems? IK: Walmart started as a Nickel and Dime Store in Arkansas, USA with no sophisticated security systems. Today it is the largest department store in the world. If you don’t have high tech security systems keep your eyes and ears wide open and be your own security until you can afford one. Keep as little cash as possible at your work place. Keep only what your business would need for the day to day operations. Any excess cash should be kept in your corporate bank account. This will save you from the shock of losing all your business capital after you have entrusted all your money in the care of your subordinates (ie. your accountant, cashier, shop attendant or managers). Employ a good accounting system which will help you keep track of your daily records to minimize or regulate theft. Big banks with high tech security systems have theft issues among their staff. So, be vigilant! If you sleep after your investments, you will always have nightmares. 7. Q: I am a Senior High School graduate. My parents have no money for my tertiary education. I want to setup a business to repair tech gadgets and build computer software. What can I do now? IK: It is good to identify your passion and interest. However, you need to be on top of your game in order to get anywhere. In whatever you do, aim at being the best. The book How To Start Small is now available on Amazon .